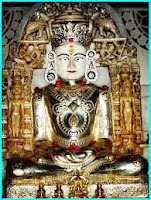 Muchhala Mahavir temple is a Jain temple dedicated to Lord Mahavir, at Ghanerao, in Pali district in Rajasthan state in India. 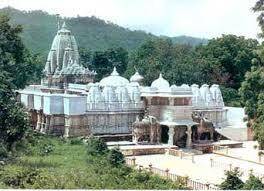 The place is on the route from Falna to Kumbhalgarh. It is 35 km away from Bali. The fair is held here every year on the thirteenth day of the month of Chaitra. The story goes that once, when the Rana of Mewar was on a hunt, he came to the temple where he was offered refreshment by the priest. The priest offered him the Prasad of the Lord, and the Rana was amused to find a strand of white hair in the Prasad, which must have fallen from the priest’s head. As a joke, the Rana asked the priest “What! Does your Lord have a moustache?” the scared priest, without realizing what he was saying, replied in the affirmative. Carrying the joke further, the Rana refused to pay his respects to the Lord that day, and told the priest that he would return after three days, and wanted to see the moustache of the lord. The priest didn’t know what to do and spent the next two days in prayer. When he did not see any results, he decided to commit suicide rather than be killed by the king. When he picked up the dagger of Bhairon at the temple to kill himself, the Lord appeared before him and advised him to cover the face of the idol with a piece of cloth and ask the king to remove the cloth himself after offering prayers. When the king arrived the next day, the priest welcomed him warmly and asked the king to have a bath and offer prayers to the Lord himself. Seeing the cloth covering the face of the idol, the king became angry and demanded an explanation. The priest repeated to the king what he had been ordered to do by the Lord. The king agreed and offered his prayers to the Lord, and when he opened the cloth, Lo and Behold! The idol of Mahavir not only had moustaches, but also a beard. The king repented for having made such a joke and asked forgiveness from the priest. He was forgiven, and the beard and moustache disappeared, but the name has stuck. The Lord has, since then, been called ‘Mucchal Mahavir’, or the Mahavir who had a moustache. We all should respect our mother. Friday, 12th August: The school reopened after three days of heavy rains. School was flooded with water from all sides. 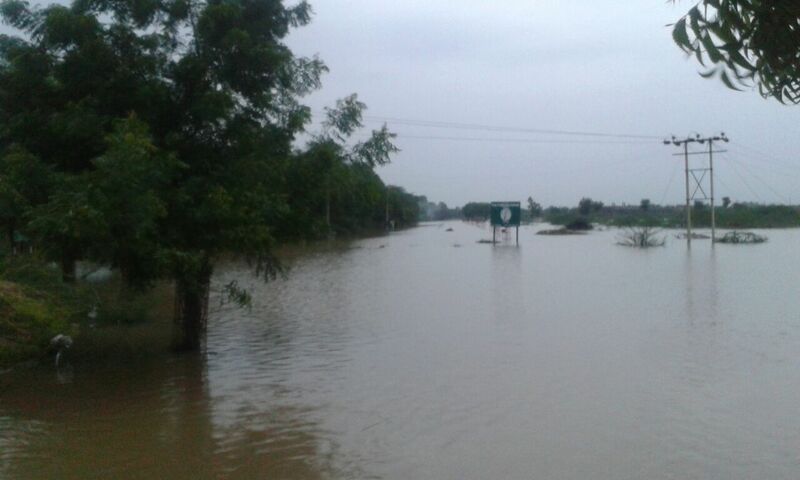 The route to school was over flooded. When water level went down students of Class IX – XII came to School and had regular school. Saturday, 13th August: Students of Class I- XII came to School. A set of students practicing as a contingent to represent the school at Bali level at Government Higher Secondary School went to Govt. Secondary School for practice. A group of girls going to represent the school at Bali level at Government Higher Secondary School went to give their audition at Govt. Girls Secondary School and got selected to give their final presentation on 15th August. Rest of the students practiced to put of cultural program in School on Independence Day.